Today Liam is three months old! That's halfway to six months! Which is halfway to a year! Which means soon he'll be off to college! My sweet little man is growing up before my very eyes. I read this article yesterday and it totally resonated with me. I never imagined myself with a son but now that I have one I am head over heels in love. 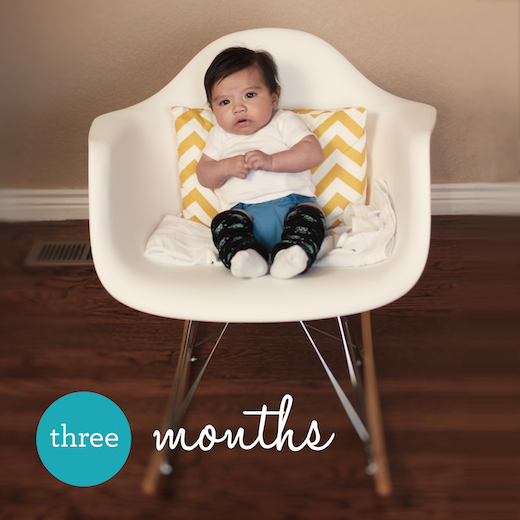 At three months Liam is developing quite rapidly. He is starting to reach out to his toys and grab them. The first time he did it I was so excited! I took pictures and put them on instagram, twitter, and facebook! I just had to share with the world. Now when I put him on his activity mat he swats at the animals hanging down. I know it sounds like nothing. I think before I had kids I wouldn't have been very impressed but just seeing how he's gone from this floppy tiny little baby to this boy who is grabbing toys all by himself in just three months...well, I can't help but be impressed. He is also starting to sit in his bumbo. He looks so cute and grown up. Liam is a very curious little boy. He likes to take in his surroundings. His eyes are always darting all around the room taking in every detail. He is smiling and laughing a lot too. When he wakes up in the morning and I say, "Hello, handsome. Good morning," he looks up to me and smiles. Melt my heart! He thinks Alex is just the most hilarious human being on the planet. Have you seen this video of him laughing at daddy's funny voices? I love it. He is rockin' those leg warmers!